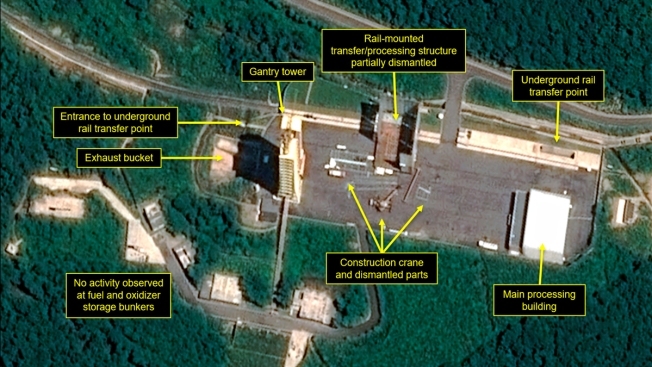 This July 22, 2018, satellite image released and annotated by 38 North on Monday, July 23, shows what the U.S. research group says is the partial dismantling of the rail-mounted transfer structure, at center, at the Sohae launch site in North Korea. 38 North said North Korea has started dismantling key facilities at its main satellite launch site in what appears to be a step toward fulfilling a commitment made by leader Kim Jong Un at his summit with President Donald Trump in June. North Korea appears to have begun to dismantle key facilities at its main satellite launch site. The North Korea-focused 38 North website said commercial satellite images indicate the North began to dismantle facilities at Sohae. An official from South Korea's presidential office on Tuesday said Seoul has also been detecting dismantlement activities at Sohae. North Korea appears to have started dismantling key facilities at its main satellite launch site in a step toward fulfilling a commitment made by leader Kim Jong Un at his summit with President Donald Trump in June. While Pyongyang could be trying to build trust with Washington as they engage in talks to resolve the nuclear standoff, analysts say dismantling a few facilities at the site alone wouldn't realistically reduce North Korea's military capability or represent a material step toward denuclearization. And they expressed concern the work is being done without verification. The North Korea-focused 38 North website said commercial satellite images between July 20 and 22 indicate the North began dismantling key facilities at the Sohae launch site. The facilities being razed or disassembled include a rocket engine test stand used to develop liquid-fuel engines for ballistic missiles and space-launch vehicles and a rail-mounted processing building where space launch vehicles were assembled before being moved to the launch pad, according to the report. "Since these facilities are believed to have played an important role in the development of technologies for the North's intercontinental ballistic missile program, these efforts represent a significant confidence building measure on the part of North Korea," analyst Joseph Bermudez wrote in the report. President Donald Trump and Kim Jong Un signed a joint statement in Singapore on Tuesday, June 12, 2018, that promised work toward building "a lasting and stable peace regime" on the Korean Peninsula. An official from South Korea's presidential office on Tuesday said Seoul has also been detecting dismantlement activities at the Sohae launch site but did not specify what the North was supposedly taking apart. Other analysts said North Korea is giving up little in dismantling the rocket engine test site when it's clear the country is satisfied with its current design of long-range weapons and could easily build other similar facilities if needed in the future. Adam Mount, a senior defense analyst at the Federation of American Scientists, said it's also troubling that the North has been apparently allowed to duck verification by unilaterally dismantling parts of its nuclear and missile facilities without the presence of international inspectors. North Korea in May invited foreign journalists to observe the destruction of tunnels at its nuclear testing ground, but did not invite outside experts capable of certifying what had been destroyed. "The actions at Sohae are a helpful signal that Pyongyang wants to continue negotiations, but do not in themselves advance nuclear disarmament," Mount said in an email. "North Korea still has not disclosed or offered to dismantle facilities that produce or store nuclear or missile systems, or the means to transport the missiles. So far, the facilities dismantled have been peripheral to these core functions." Lee Choon Geun, a missile expert at South Korea's Science and Technology Policy Institute, said the North's supposed move to dismantle the rail-mounted processing building was the more meaningful development as it potentially indicated to broader dismantlement activities at the site. "If North Korea goes further and dismantle the entire Sohae site, that would meaningfully reduce the country's long-range missile capability by eliminating a facility where it could fire multiple ICBMs in succession," Lee said. "The North can also fire ICBMs from transporter erector launchers, but their technology with these vehicles isn't stable." President Donald Trump and North Korean leader Kim Jong Un met face-to-face Tuesday in Singapore. 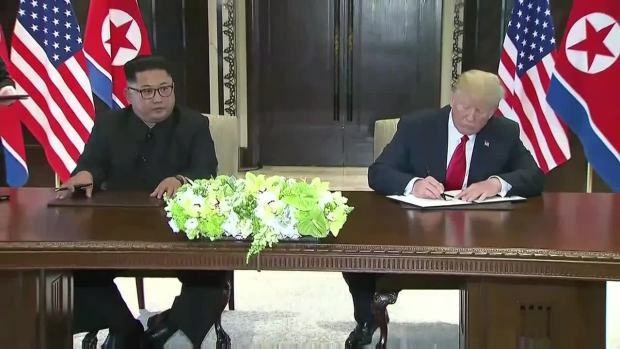 The historic summit produced a document in which Kim reiterated a pledge to work toward denuclearization and Trump offered security guarantees. However, Mount said the military consequences of a broader dismantlement would be "marginal." North Korea has invested a great deal of effort in ensuring its missiles can be fired from austere locations and doesn't require a site like Sohae, he said. "Dismantling a test site does not seriously constrain the existing arsenal or even future designs," said Mount. "While it would be a significant step for the regime to shut down its space launch programs, it has always argued that these programs are distinct from military ones. Easing the missile threat would require restrictions on the number, types, or capabilities of missiles or the vehicles that transport and fire them." After his summit with Kim in Singapore on June 12, Trump said he was told by Kim that the North was "already destroying a major missile engine testing site" without identifying which site. The leaders concluded their summit by declaring their vague aspirational goal of moving toward a nuclear-free Korean Peninsula, but there's lingering doubts on whether Kim would ever agree to fully give up the nuclear weapons he may see as a stronger guarantee of his survival that whatever security assurances the United States can provide. Kim in late 2017 declared his nuclear weapons and missile program was complete, following a torrent of nuclear and missile tests that include the detonation of a purported thermonuclear warhead and flight tests of three developmental ICBMs potentially capable of reaching the U.S. mainland. Kim announced the mission of his nuclear testing site as finished weeks before inviting foreign journalists to observe the destruction of the tunnels. The South Korean presidential official, who didn't want to be named, citing office rules, said the supposed dismantlement activities shows the North is moving gradually. "We need further analysis to figure out why the North didn't turn the dismantlement activities into an event and whether the country is trying to control the speed of the process to maintain a pace it wants," he said.